Predictive computation is rapidly becoming the new focus of computer science and technological development. In some cases, under marketing pressure, it is characterised as â€˜anticipatory computing.’ In other cases, computation is expected to deliver predictive phenotyping, or new materials that will behave according to predefined expectations. Since dealing with the future is significant from the perspective of acknowledging and preparing for change, concepts pertinent to describing the future take on importance. 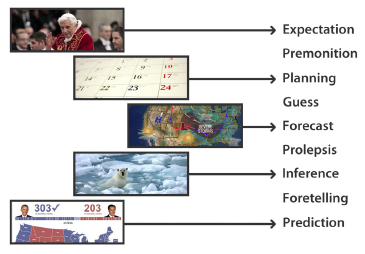 There is a pragmatic necessity for establishing a common understanding of various aspects of prediction: forecasting, premonition, guessing, inference, foretelling, prolepsis, expectation, etc. Technology affords new possibilities, such as wearables and mobile computation. However, technology does not substitute for a sense of direction. 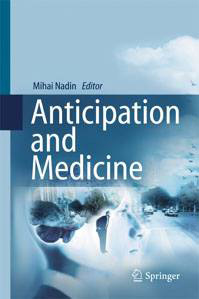 When I first discussed the notion of anticipatory computing (Nadin, 1991, 2000, 2010), it was not yet clear to which extent a definitory characteristic of the living – anticipation – could be partially or entirely expressed in computational form. Today, â€˜predictive’ computation (sometimes sold as â€˜anticipatory’ computation) is rapidly becoming a dominant pursuit in both computer science research and technological advancement. While Markov models and random-walk based techniques are adapted to short-term descriptions of change, long-term remains elusive, despite progress in large data sets analysis. (Even Microsoft’s Far Out does not qualify as a consistent method for long term predictions.) Fourier based analysis, for example, enables the discovery of interesting periodicities, but there is quite a distance between periodicity and patterns. This article is not about an â€˜I was the first’ claim, but rather a contribution to conceptual clarity. In its two parts, it is focused on defining the nature of the various forms through which statements about the future are made, and in analysing what kind of computation adequately supports the processing that leads to prediction. In this respect, it is essential to understand why the algorithmic form of computation, dominant today, is challenged and what the alternatives are. Being part of a reality within which everything associated with human existence is, in one way or another, dependent on computers undermines the effort of a neutral evaluation. This text originates in a word processing program, uses speech recognition and image processing and makes use of machine learning based search of references. There are predictive features that definitely help in the writing and review process. Tools, such as those just mentioned, are not passive partakers in human activity. They â€˜make’ a new content, a new user, a new public, a new culture. Predictive computation will definitely influence the process and contribute to a human profile more focused on immediacy than on the vector of change. Our brains change, and the motoric is often affected. This is all the more important as we realise the ubiquity and diversity of computation; but also as we realise that a new human condition is ascertained, to the extent that humankind might either project itself into a way more exciting future than ever, or, alternatively, wipe itself out (or at least place itself on a degenerative path) and thus eliminate humans from the dynamics of evolution, or at least diminish their influence. Between the living and the physical – which is subject to descriptions constituting a body of knowledge known as physics – there is a definite systemic distinction: the living is complex; the physical is complicated. To reproduce here the arguments upon which this epistemological model is based would probably invite the attention to a subject different from that pursued along these lines. Suffice it to say, the criterion used is derived from Gödel’s (1931) notion of the undecidable: entities of complex nature, or processes characterised as complex, cannot be fully and consistently described. The living is undecidable. The physical is decidable. Of course, Gödel referred to descriptions of reality (a nominalist view), to statements about it and to the logic guiding such statements and further operations upon them. My take (resulting in the definition of Gcomplexity, (Nadin, 2013, 2014) is that the decidable/undecidable defines real states of complementary nature (physics vs. living). Anticipation is associated with the undecidable nature of the living. Anticipation pertains to change, that is, to a sense of the future. The image (Figure 1) is suggestive. To comment on the images would only result in anecdotal evidence. First, let us clarify some of the terms which are represented in the image more in a suggestive manner. Lex III: Actionicontrariam semper etÃ¦qualemessereactionem: sivecorporumduorumactiones in se mutuo semper esseÃ¦quales et in partescontrariasdirigi. If body A exerts a force F on body B, then body B exerts an equal and opposite force –F back on body A. The subscript AB indicates that A exerts a force on B, and BA indicates that B exerts a force on A. The minus sign indicates that the forces are in opposite directions. Often FAB and FBA are referred to as the action force and the reaction force; however, the choice of which is which is completely arbitrary. Descriptions of entities and processes restricted to the dynamics originating in action–reaction can be fully and non-contradictorily described. This applies across the reality of physics – from the micro-universe to cosmic space. The living, like the physical, is embodied in matter; hence the reactive dynamics is unavoidable. However the physical dynam that is, how change of matter takes place – of what is alive is complemented by the anticipatory dynamics – how the living changes ahead of what might cause its future condition. Awareness of change, as it pertains to the living is reactive – we react (to changes in temperature, to stimuli, to other people, etc.) – but, at the same time, also anticipatory (preparedness, as well as foresight, for instance). Adaptivity over shorter or longer intervals is the specific expression of this interplay. From a physics perspective, the following would appear as unavoidable: a stone and a cat of equal weight fall (Figure 2), regardless of the moment in time and even regardless of the measuring process, acceding to the Law of Gravity. But the stone falls â€˜passively’– along the path of the gravitational force. The fall of a cat is suggestive of anticipation. It is expressed in action, and it is meant to preserve life (the cat usually avoids getting hurt). This description omits some variables related to air resistance (object’s shape, air density, effect of temperature and humidity, etc.). The cat falls â€˜actively’. The cat’s response to falling (even if the fall is accidental, i.e., not caused within an experiment) is at least a change in geometry: turning increases the surface and thus air resistance. The equation pertinent to the fall of the stone still applies, but in a rather approximate way. The living â€˜fights’ gravity. The past (cat’s position at the start of the fall), but also the possible future (how and where to land) affect the outcome. Predictive computing describes the falling of the stone without any difficulty. Once the height is established, the rest is trivial. The fall of a cat still escapes a computational description (short of â€˜reading the cat’s mind’). But since the cat’s falling became a mathematical problem, let’s take a closer look so that we understand why the â€˜recipe’ for calculating the parameters of physical phenomena cannot be extended to predictions of living processes. For some mathematicians, the falling cat problem consists of explaining the physics underlying the common observation of the â€˜cat-righting reflex,’ that is, how a free-falling cat can turn itself right side up as it falls, no matter which way up it was initially, without violating the law of conservation of angular momentum. All that counts is that a cat falls on its legs. Applied differential geometry allows for the approximate description of an object flipping itself right side up, even though its angular momentum is zero. In order to accomplish that, it changes shape (no stone changes shape in the air). In terms of gauge theory, the shape-space of a principal SO(3)– bundle, and the statement, â€˜Angular momentum equals zero,’ defines a connection on this bundle. The particular movement of paws and tail conserves the zero angular momentum. The final upright state has the same value. This is the â€˜geometric phase effect,’ or monodrony. The idea is simple: Let a cat fall and derive the pertinent knowledge from the experiment. (In 1882, Marey used a chronophotographic gun for this purpose; we use motion capture equipment.) But this is no longer a reproducible event. It is not the passive fall of a stone – reproducible, of course – but the active fall embodying anticipation. The outcome varies a great deal, not the least from one hour to another, or if the landing topology changes. The stone will never get tired, annoyed, or excited by the exercise. And it will never learn. We shall explain this, in reference to the cat’s fall, using images (Figures 3 and 4). Figure 3: Representation of a falling cat. (Drawing by E. Kuehne, in Mehta, 2012, p. 5). 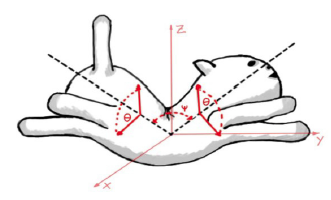 The cat’s shape is given by two angles:(Î¸)(Ïˆ); Ïˆ is the angle between the two halves of the cat’s body; Î¸ describes the direction of the cat’s legs (Î¸= 0 when the front and back legs are closest to each other); A change in Î¸ corresponds to a rotation of the cat’s body around the spinal axis. Predictive computation could benefit from the mathematics of the falling cat, but it will have to somehow describe other variables, such as what it means to the cat that it is being observed? (Of course, it means nothing to the falling stone!). Heisenberg’s (1927) uncertainty relation, although characteristic of quantum mechanics measurement, can be conjured in analysing the subject. It suggests that, although such descriptions can be particularly accurate, we are, in observing the falling of a cat, not isolated viewers, but co-producers of the event, therefore influencing the result. The falling of human beings, of consequence as we advance in age, make it clear that â€˜to know how to fall,’ as the cat obviously does, is more than a mere problem in physics or a mathematical exercise. Just as an aside: Apple, Inc. patented a method for controlling the accidental fall of the iPhone, inspired by the cat’s fall (cf. Fig. 5). The phone, with its vibration motor programmed to change the angle of the falling mid-air, based on data from the positioning sensors, will be directed to fall on its back and thus avoid damage to the display. The patent is, in its own way, an example of engineering inspired by anticipation expression in the living. Of course, the phone, like the stone in the experiment mentioned before, does not care whether someone is observing its fall or not. 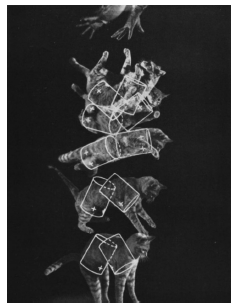 Figure 4: This image is representative of the Kane-Scher (1969) solution to why cats fall on their feet (reproduced from Mehta, 2012). The unity reaction–anticipation corresponds to a different condition of matter and its change over time. The measurement process, that is, the observation of the change (the falling cat), influences the outcome. The living can observe the physical. And it continuously does! The physical does not have an observation capability. It is rather a stage on which the living performs (including reshaping the stage). Perception is nothing more than the process through which awareness of here and now is established. 2. EXPECTATION, GUESSING, PREDICTION We become aware of anticipation when it is successful: falling the â€˜right way’, avoiding danger, successful creative activities, for example. But we can gain awareness of it through processes in which it is sometimes involved. Some of its aspects – from guessing and expectation to prediction and planning – are indicative of the fact that reaction and anticipation are intertwined. Acknowledged in language (and even in experiments) are various forms of what is called premonition (of danger, usually), foretelling (mostly associated with the dubious commerce of â€˜seeing into the future’), not to mention curses and blessings and voodoo. Each of these is a combination of reaction and anticipation. 2.1. Guessing To guess is to select from what might happen – a sequence of clearly defined options – on account of various experiences: one’s own; of others; or based on unrelated patterns (the so-called â€˜lucky throw’ of a coin or dice, for example). The reaction component (â€˜I know that the person asking the question likes the queen of hearts!’) and the anticipation are aggregated in a manner that qualifies some individuals as better than others in guessing (see Figure 6). â€˜Guess what number I chose?’ (or which card, or what word, etc.). Reactions are based on the evaluation of the information pertinent to the situation – different when one visits a fortune teller or a casino than when one guesses the correct answer in a multiple-choice test. In the multiple-choice situation, one infers from the known to the unknown. There is learning in guessing as patterns emerge: the next attempt integrates the observation of related or unrelated information. This associative action is the cognitive ingredient most connected to guessing and, at the same time, to learning. (We retain patterns and recall them when faced with choices.) The rest is often statistics at work, combined with ad hoc associative schemes pertinent to what is possible. (That’s where premonition, discussed above, comes into play.) Let us acknowledge that guessing (as well as learning) is reduced to nil in predictable situations. The anticipation component of guessing is related to the state of the self. Recent research of responses of the human frontal cortex to surprising events (Fletcher et al., 2001) points to the relation to learning mentioned above. The dorsolateral prefrontal cortex contributes to the adjustment of inferential learning. Associative relationships (Figure 7) leading to learning (qualified as associative) are based on the action of discriminating the degree (strength) of interrelation. Of course, fuzzy sets are the appropriate mathematical perspective, if we want to describe such interrelations. Empirical data (statistics, actually) document â€˜better days,’ which means above-average guessing performance. This corresponds to a variety of circumstances: additional information about the process (acquired consciously or, most of the time, through processes â€˜under the radar’), a state of cognitive or sensorial alertness (for whatever reason), or simply a statistic distribution (â€˜lucky’), to name only a few. There is no magic in the exceptional (a â€˜good’ day, â€˜bad luck’), but there is quite a bit to consider in terms of the large number of variables involved in the outcome of human actions. The manner in which anticipatory action is intertwined with the reactive is difficult to describe exactly because of the multiplicity of factors involved. If anything, anticipation actually undermines the guessing performance, given its non-deterministic nature; it integrates the subjective, the emotional, the spontaneous. A guessing machine – computer or any other type of machine – can automate the guessing knowledge specific to well-defined selection and thus outperform the guessing living (not only human beings are involved in guessing as they face change). Predictive computation is pretty much a game of guessing. Machine learning and AI procedures provide a good basis for such applications. 2.2. Expectation In comparison to guessing, expectation does not entail choosing (â€˜Heads or tails?’), but rather an evaluation of the outcome of some open-ended process. Weather is often expected – inferred from opinion, observation and data – not guessed. So are the outcomes of activities that weather might influence. Agriculture practiced prior to the integration of digital information in agricultural production was often in the realm of the expected. A cornfield is not equally fertile in every spot. Learning how to increase production by extracting data (through GPS-based measurements) pertinent to fertility and applying fertilisers or planting more seeds in certain spots grounds expectation in knowledge. And thus makes it look like an algorithm. The Climate Corporation is in the predictive computation business. It works with large streams of data (mainly climate related) to assess future risk and current damage. Its sensor network helps in the analysis and in the prediction of variables such as temperature, precipitation, soil moisture and yields for over 20 million U.S. farms. An expectation machine is actually a learning procedure that attaches weights (some subjective) to choices from the limited set of possibilities. The reactive component dominates the anticipatory. False expectations (of personal or group significance) are the outcome of skewed evaluations. Expectation and superstition are examples of such evaluations. They are driven more by desire or wishful thinking that tends to falsify the premise (adding self-generated data to the factual incomplete knowledge). Among the cognitive illusions (Kahneman and Tversky, 1996) existing in culture are those formed by gamblers (Delfabbro, 2004) as well as by professionals acting in a state of over confidence. Physicians making inferences based on limited medical tests (Gigerenzer, 2011; Sedlmeier and Gigerenzer, 1989); coaches captive to the â€˜hot-hand’ model (Tversky and Gilovich, 2012; Miller and Sanjurjo, 2014); economists absorbed in data patterns more relevant to the past than applicable to future developments (Hertwig, 2005) can be given as examples. These have in common the perception of random and non-random events. Statistically significant deviations from the expected (the average scoring performance of a gambler in a casino, of a basketball player, of the stock market, etc.) lead to beliefs that translate into actions (a gambler can be refused entry, the basketball player believed to have a â€˜hot-hand’ day faces a stronger defence, hot stock market days mean more trades, etc.). Physicians interpret deviations in respect to expected values (blood glucose, cholesterol, vitamin D and creatinine), and automatic procedures (comparison with average values) trigger warnings. In the computational ecology there are no cognitive illusions, but there is, of course, the risk of wrong estimates and thus wrong predictions. Connecting cause and effect, associating data, generalised from statistical observations describing their connection, is the easiest way to characterise prediction. Causality, as the primary, but not exclusive, source of predictive power is rarely explicit. Prediction – explicit or implicit – expresses the degree of ignorance: what is not known about change. Therefore, it is representative of the limits of understanding whatever is predicted. In some cases, the prediction is fed back into what we want to predict: how a certain political decision will affect society; how an economic mechanism will affect the market; how technological innovation (let’s say multimedia) will affect education. As a result, a self-referential loop is created. The outcome is nothing more than what is inputted as prediction. Those who predict are not always fully aware of the circularity inherent in the process. The impossibility of disconnecting the observer (subject, in learning) from the observed (the object of learning) is an inherent condition of learning, whether human or machine learning. The constructivist perspective demonstrated the point quite convincingly (Glasersfeld, 1995). 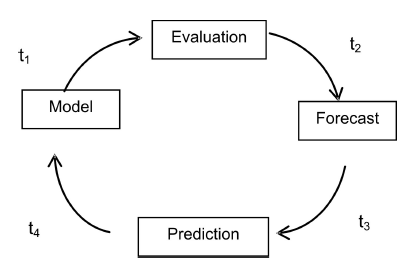 Prediction machines of all kind are deployed in situations in which the outcome is associated with reward/ punishment (loss). In particular, Bayes-inspired prediction is driven by a hypothesis: you â€˜know’ the answer, or at least part of it. Predictions of election results, of weather patterns, of sports competitions are based on such assumptions. Prediction as a process that describes the outcome of action–reaction dynamics can be usefully affected by experiential evaluations. On the new predictive applications deployed so far, the fine tuning is the result of learning. You have to train your device as you had, not long ago, to train the speech recognition program. But there are also predictions driven, to an extent larger than the Bayesian state of belief, by anticipatory processes. How much of this realm is computable remains an open question. Falling in love at first sight – which is neither guessing nor expectation – is a prediction difficult to make explicit. (It combines rationality and consistency with a subjective perspective.) There is no explicit cause-and-effect connection to uncover, and no frequencies to account for. The future state (the romantic ideal of a great love, or the calculated outcome of an arranged marriage) affects current states as these succeed each other in a sequence of a time often described as â€˜out of this world.’ Data from MRI based attempts at describing processes associated with falling in love are not yet effectively translated into predictive procedures. Facial expression as a predictor is yet another example of Bayesian probability-based inferences. It is, of course, of interest to those conceiving predictive products of all kind. In very sophisticated studies (Ekman and Rosenberg, 1997; Ekman, 2003), it was shown that the â€˜language’ of facial expression speaks of facts to happen before they are even initiated – which is anticipation in pure form. The Facial Action Coding System (FACS), which is a taxonomy of facial expression (and the associated emotional semantics), inspired Rana El Kalioubi in her work on computationally interpreting the language of faces. For those who â€˜read’ the face’s expression, for example, for those who learned the language of facial expression, the emotion predictions based on their own anticipation guides their action. Descriptions of the relation between expectation and prediction are informative in respect to the mechanisms on which both are based. The various levels at which learning – different in expectation-driven from prediction-based decisions – takes place are not independent of each other. Expectations pertain to more patterned situations. They are often an expression of what in ordinary language is described as stereotype or, in some cases, as wishful thinking. However, when the individuals become involved in the activity of predicting (literally, to say beforehand, i.e., before something happens), they expect the prediction to actually take place. It is no longer a wish, but rather the human desire, expressed in some action, to succeed. Many activities, from policing the streets to conceiving political reform, urban development, military strategy, educational plans (to name a few with features little or not at all in common) are informed by the very competitive â€˜industry’ of predictions. Generalising from the past can take many forms. Evidently, the focus is on relationships as a substratum for deriving instructions pertinent to the present and of relevance to the future. Ignorance, which is what probabilities describe, is fought with plenty of data. The typology of predictions (linear, non-linear, statistical inference, stochastic, etc.) corresponds to the different perspectives from which change and its outcome are considered. The limited deterministic perspective, mechanic in nature, repetitive –, which cause leads to which ensuing effect – affects the understanding of anticipation through a description of predictive mechanisms. Predictions following known methods (such as time series analysis and linear predictors theory) capture the reaction component of human action (Arsham, 2002).The anticipatory component is left out most of the time, as a matter of definition and convenience: complexity is difficult to recognise and even more difficult to handle. Once a predictive hypothesis – let’s say every minute the clock mechanism engages the minute hand – is adopted, it defines the cognitive frame of reference. On a digital display, the predictive hypothesis will be different. Should the predicted behaviour of the mechanism somehow not take place, the expectation is tested. However, mechanisms, as embodiments of determinism, rarely fail. And when they do, it is always for reasons independent of the mechanism’s structure. Predictions concerning the living are less obliging. Structure matters, interdependencies are fundamental. It happens at all levels of the living that predictions – what will happen next (immediate or less immediate future) – are either partially correct or not at all. In studying learning and selective attention, Dayan et al. (2000) refer to reward mechanisms in the Kalman filter model (more experience leads to higher certainty). For any process in progress – for example, moving a vehicle, recalling a detail in an image, thinking something out – there are, from the perspective of the Kalman filter, two distinct phases: (1) predict; (2) update. The filter is a recursive operation that estimates the state of a linear dynamic system. In physical entities, the space of observable parameters is smaller than that of describing the degrees of freedom defining the internal state. In the living, the situation is reversed. Learning, for instance, triggers expectations that turn out to be a measure of how much the deterministic instinct (culture, if you prefer) takes over the more complex model that accounts for both reaction and anticipation in the dynamics of the living. Predictors reflect the desire to understand how change takes place. They express the practical need to deal with change. However, they leave change out of the equation of those predicting or subject to prediction. Actions from thoughts, as Nicolelis (2001) calls them, account for the self-awareness of change. What is learned supports inferences (statistical or possibilistic); uncertainty results as the competitive resources engaged in the inference are overwritten by unrelated factors. Predictions also capture the interconnectedness of all elements involved in the dynamics of the observed. Learning involves predictions. In this sense, they open access to ways to emulate (or imitate, to use another word) change. Expectations have no direct learning component: One cannot learn explicitly how to expect, even accepting that there might be structure in the learning process after an expectation is validated, and in the representation associated with the expectation. Expectations only occasionally produce knowledge: a series of expectations with a certain pattern of success, or failure for that matter. Predictions, even when only marginally successful, support activities such as forecasting – for short or less than short sequences of change – of modelling, and of inference to the characteristics of the observed dynamic entities. Prediction-data show that torture occasionally begets information. A torture information production machine – for example, a computer, or better yet, a robot, with the applicable moral constraints built in – would decide on a cost-benefit analysis model whether torture should be applied or not. In retrospect, it is evident that guessing would be a weak description of the future: it has the highest margin of error. Expectation would not be much better: a machine does not output expectations since their variability escapes algorithmic descriptions. Predictions, especially in the Bayesian sense, are more effective. Based on the Report of the Senate Intelligence Committee on the CIA counter-terrorism program, some cases of torture were doomed from the outset. Predictions regarding the living, although inappropriate for systematically capturing their anticipatory dimension, are a good indicator of what is lacking when anticipation is ignored. An example: in focusing only on human beings, predictions based on physiological data remain at a primitive stage at best, despite the spectacular progress in technology and in the scientific theory of prediction. Streams of data (from a multitude of sensors) in association with some analytical tool (data-mining, usually) could, of course, help identify where and how the physical component of life is affected by change (aging, environment, medical care, hygiene, alimentation, driving, etc.). The reactive component of what is called â€˜health’ is of extreme importance. Clogged arteries, degradation of hearing or of the eyes can be identified with the help of realtime monitoring of blood pressure, hearing and the macula. But they remain partial indicators. In evaluating change in the condition of the living, of the human being, in particular, what counts are not only the parts under observation, but their interconnectedness, especially of the whole. Reaction is reductive. Anticipation is a holistic expression. Albeit, if we could improve such predictions by accounting for the role of anticipation – the possible future state influencing, if not determining, the current state – we would be in a better position to deal with life-threatening occurrences (strokes, sudden cardiac death, diabetic shock, epileptic seizure, etc. (Nicolelis and Lebedev, 2009). Learning about such occurrences in ways transcending their appearance and probability is one possible avenue. 2.5. Forecasting and Planning Predictions, explicit or implicit, are a prerequisite of forecasting. The etymology points to pragmatics, one that involves randomness – as in casting. Under certain circumstances, predictions can refer to the past (more precisely, to their validation after the fact). Take a sequence in time – let’s say the San Francisco earthquake of 1906 – and try to describe the event (after the fact). In order to do so, the data, as registered by many devices (some local, some remote) and the theory are subjected to interpretations. The so-called heat– flow paradox is a good example. If tectonic plates grind against one another, there should be friction and consequently heat. This is the result of learning from physical phenomena involving friction. Along the well-known San Andreas Fault, geologists (and others) have measured (and keep measuring) every conceivable phenomenon. No heat has been detected. The generalisation from knowledge regarding friction alone proved doubtful. Accordingly, in order to maintain the heat dissipation hypothesis as a basis for forecasting, scientists started to consider the composition of the fault. This new learning – extraction of regularities other than those pertaining to friction and heat dissipation – was focused on an aspect of friction initially ignored. A strong fault and a weak fault behave differently under stress, and therefore release different quantities of heat. This is a case in which data is fitted to a hypothesis – heat release resulting from friction. To adapt what was learned to a different context is frequently used in forecasting. In other cases, as researchers eventually learned, what was measured as â€˜noise’ was treated as data. Learning noise patterns is a subject rarely approached. Procedures for effectively distinguishing between noise and data – the experience of mobile computation makes this distinction necessary – are slow in coming, and usually involve elements that cannot be easily identified. To ascertain that something will happen in advance of the actual occurrence – prediction (the weather will change, it will rain) – and to cast in advance – forecast – (tomorrow it will rain) might at first glance seem more similar than they are. A computer program for predicting weather could process historic data: weather patterns over a long time period. It could associate them with the most recent sequence. And in the end, it could come up with an acceptable global prediction for a season, year, or decade. In contrast, a forecasting model would be local and specific. The prediction based on â€˜measuring’ the â€˜physical state’ of a person (how the â€˜pump,’ i.e., heart and â€˜pipes,’ i.e., blood vessels, are doing, the state of tissue and bone) can be well expressed in such terms as â€˜clean bill of health’ or â€˜worrisome heart symptoms.’ But it can almost never become a forecast: â€˜351 days later, you will have a heart attack;’ or â€˜In one year and seven hours, you will fall and break your jaw.’ Or even: â€˜This will be a historic storm’ (the prediction, so much off target, of the â€˜Nor’easter’ of January 2015). Forecasts are not reducible to the machine structure. They involve data we can harvest outside our own system (the sensorial, in the broadest sense). For the acquisition of this kind of data sensors associated with mobile computation are very useful. Forecasts involve also data that human beings themselves generate (informed by incomplete knowledge or simplified models). Direct access to this data is difficult, but once again sensors of all kind (signalling sweating or muscle engagement) are tried in order to get at least some insight into the user. The interplay of initial conditions (internal and external dynamics, linearity and nonlinearity, to name a few factors), that is, the interplay of reaction and anticipation, is what makes or breaks a forecast. To summarise: forecasting implies an estimation of what, from among few possibilities, might happen. The process of estimation can be based on â€˜common knowledge’ (â€˜Winds from the west never bring rain’); on time series; on data from cross-sectional observation (the differences among those in a sample); or on longitudinal data (same subject observed over a long time). Evidently, forecasting is domain specific. Meteorology practices forecasting as a public service; commerce needs it for adapting to customer variability of demand. Urban planners rely on forecasting in order to optimise municipal dynamics (housing, utilities, traffic, etc.). The latter example suggests a relation between forecasting and planning. How change might affect reality in comparison to how change should affect reality distinguishes forecasts from predictions. 3. SELF-AWARENESS, INTENTIONALITY AND PLANNING The human being has a distinct condition in the extraordinary large realm of the living. It depends on a variety of other forms of living (billions of bacteria, for instance, inhabit the body), but in the larger scheme of things, it acquired a dominant position. In our world, human activity is, for all practical purposes, the dominant force of change. Humans â€˜are what we do’ (the pragmatic foundation of identity, Nadin (1997, pp. 258ff; 2013). The only identifier of human actions (and of other living entities) is their outcome. This is an instantiation of identity at the same time. The question, â€˜What do you do?’ cannot be answered with â€˜I anticipate,’ followed, or not, by an object, such as â€˜I anticipate that an object will fall,’ or â€˜I anticipate my wife’s arrival,’ or â€˜I anticipate smelling something that I never experienced before.’ Anticipation is a characteristic of the living, but not a specific action or activity. Humans do not undertake anticipation. They are in anticipation. It is not a specific task. Anticipation is the result of a variety of processes. As an outcome, anticipation is expressed through consequences: increased performance – an anticipated tennis serve is returned; danger – such as a passing car – is avoided; an opportunity – in the stock market, for instance – is used to advantage. Anticipatory processes are autonomic. Implicit in the functioning of the living, such processes result in the proactive dimension of life. This is where identity originates. Anticipatory processes are defined in contrast to reaction, although they often imply reaction as well. Anticipation at the level of preserving existence is unreflected. Facial expression in anticipation of an action is a good example here, too. It seems that facial expression is not defined on a cultural level but is species wide (Ekman, 2003; Gladwell, 2002). It is not a learned expression. Individuals can control their facial expression to an extent. However, there is always that one second, or less, in which control is out of the question. Intentionality is always entangled with awareness – one cannot intend something without awareness, even in vague forms. But this awareness does not automatically make human expressions carry anticipations more than the expression of the rest of the living. We sweat â€˜sensing’ danger even before we are aware of it. The difference is evident on a different level. Humans reach self-awareness; the mind is the subject of knowledge of the mind itself. As such, we eventually recognise that our faces â€˜speak’ before we act (or before perspiration starts). They are our forecasts, the majority of them involuntary. Those intent on deciphering facial expression obtain access to some intriguing anticipatory mechanisms, or at least to their expression. Planning (Figure 8) is more than calculation. A planning machine for integrated activities carried out in an open system over a longer period of time would require real-time adaptive capabilities. To prepare for a worst-case situation, one would have to generate possible breakdown timelines and provide contingency measures for each. Various reactive components (which correspond to reactive planning, i.e., how to react) can be effectively described in computational terms. 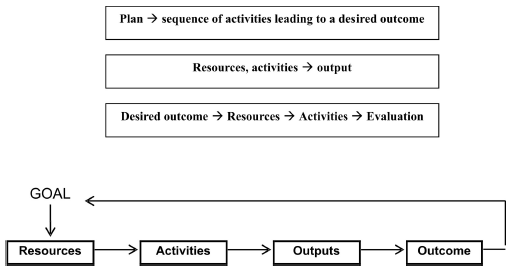 For instance, process planning maps from design (which is an expression of anticipation) to instructions and procedures, some computer-aided (e.g., 3D printing), for effectively making things, or changing things. Operations (deterministic), operation sequences, tooling and fabrication procedures are described in computer process planning and serve as input for automated activities. Planning, expressed through policy-making, management, prevention, logistics and even design, implies the ante element – giving advance thought, directing towards something, looking forward, engaging resources (including the self). Moreover, it implies understanding, which resonates with the initial form of the word denoting anticipation: antecapere. As such, the activity through which human beings identify themselves as authors of the blueprint of their actions takes place no longer at the object level, but on a meta-level. It is an activity of abstracting future actions from their object. It is also their definition in a cognitive domain not directly associated with sensory input, but rather with understanding, with knowledge. Plans synthesise predictive abilities, forecasting and modelling. A plan is the expression of understanding actions in relation to their consequences (see Figure 8). It is what is expressed in goals and means to attain these goals, as well as the time sequence for achieving them. A plan is a timeline; it is a script for interactions indexed to the timeline. To what we call understanding belong to goals, the means, the underlying structure of the endeavour (tasks assumed by one person, by several, the nature of their relation, etc. ), a sense of progression in time, awareness of consequences, that is, a sense of value. As such, they report upon the physical determination of everything we do, and of the anticipatory framework. In every plan, from the most primitive to the utmost complex, the goal is associated with the reality for which the plan provides a description (a theory), which is called configuration space. If it is a scientific plan, such as the exploration of the moon or the genome project, the plan describes where the â€˜science’ actually resides, where those equations we call descriptions are â€˜located.’ If it is a political plan, or an education plan, the configuration space is made up of the people that the plan intends to engage and of the means and methods to make it work. Our own description of the people, like the mathematical equations of science, is relative. Such description of the configuration space, and, within that space, of the interactions through which people learn from each other are subject to adjustments. The plan also has to describe the time-space in which the goal pursued will eventually be embodied. This is a manifold, towards which the dynamics of actions and interactions (social context) will move those involved. In science, this is the landing on the moon, or the map of the human gene; it can as well be a new educational strategy or, in politics, the outcome of equal opportunity policies. All of these are anticipations projected against the background of understanding change in the world as an expression of the unity between the dynamics of the physical and the living. Plans spell variables to be affected through actions, and the nature of the interrelationships established in pursuing the plans. Quite often, plans infer from the past (the reactive component) to the future (proactive component). They also project how the future will eventually affect the sequence of ensuing current states. Planning and self-regulation are related. The inner dynamics of phenomena and their attractors – the goals to be attained – reflect this interconnectedness. These attractors are the states into which the system will settle – at least for a while. They are the descriptions of self-organising processes, their eventual destination, if we can understand it as a dynamic entity, not the statement of a static finality. Planning sets the limits within which adaptive processes are allowed. Each plan is in effect an expression of learning in action. Knowledge of future states is a matter of possibilistic distributions. is associated with a possibility distribution Î x Nothing is probable unless it is possible. Not every possible value becomes probable. The anticipated performance (Glasersfeld, 1995) and the actual performance are related. Their difference, together with the reward mechanism, guides the learning component. Functioning under continuously changing conditions means that control mechanisms will have to reflect the dynamics of the activity (Figure 10). This is not possible without learning. If we finally combine the automated part (everything involving the change of the physical can be automated) and human performance, expressed in behavioural features, we arrive at an architecture that reflects the hybrid nature of plan-driven human activities feed values into the sensors. Based on these values, the system is reconfigured under the control of the dynamic model continuously refreshed in accordance with the behaviour of the world. Learning results in the process of successive refreshment of data. Effectors act upon the world as a control procedure. Indexed behavioural features (of students in a class, patients, vehicle drivers, airplane pilots, politicians in a power position, etc.) and the methods for extracting regularities characteristic of their behaviour are connected. Learning ensues from adapting to new circumstances (i.e., change). The â€˜learning’– classroom, physicians office, car, airplane, management system guiding a Prime Minister or a Secretary of State, for example, – is thus one that combines its own dynamic (modified, evolving knowledge) and that of the persons involved (anticipation included). The suggestion here is that conceiving intelligent classrooms, intelligent schools, intelligent cars and airplanes, intelligent â€˜assistants’ for those in power is characteristic of an anticipatory perspective. However, the perspective does not automatically translate into pro-active activity (most of the time the system remains reactive).Embodied intelligence and the intelligence of challenged users could augment the perception of time, and thus help mitigate consequences of change for which society is rarely (if ever) prepared. If the generic diagram of the hybrid control mechanisms endowed with learning conjures associations with the smartphones of our time (i.e., mobile computing), it is not by accident (as we shall see in the second part of this study). Pursuing the enticing goal of making everything behave like a machine – and paying the price for it – stands in sharp contrast to a vision of acknowledging the living and its definitory anticipation. One writer put it in quite expressive terms: â€˜Think of the economy as being more like a cat than a washing machine,’ (Taleb, 2012). Evidently, becoming servants to robots, as Shannon cavalierly conceded, goes in the opposite direction. With this note, we are back to the preliminaries to the broader question of whether anticipatory computing is possible. Aspects of life such as human mobility, services and urban development, are evidently connected. When people move, they assume not only the existence of roads and airports, but also water, electricity, medical care, education, etc. Therefore, as I discussed concepts, I made a point of dealing with planning as well. Considering computer industry claims (e.g., Cigna CompassSM, the MindMeldiPad app, Expert Labs, among others), the question of whether anticipatory computing is possible appears to be meaningless. The public and the major users of computation (banks, the military, healthcare, education, the justice system, etc.) are enticed by gadgets supposedly able to perform anticipations. Leaving aside the marketing gags – â€˜We know where you will be on February 2, 2017 and with whom’ states the Nostradamus bot – what remains, as we shall see, are computations with predictive features. The reason for this extended study of whether anticipatory computing is possible is to set the record straight and inform future work that reflects the understanding of anticipatory processes. For the sake of this understanding, let us take note of the fact that computation – yes, calculations of all kind: in our mind, by hand, using some device, such as an abacus – were always predictive. Just for illustration purposes: a more than 500-year-old woodcut (The Allegory of Arithmetic). This image is part of the Margarita Philosophica describing the mapping from a counting board (for some reason, Pythagoras was chosen as a model) to the emergent written calculation (in which for some even more obscure reason Boethius is depicted). In this image, Hindu number representations are used in what emerges as the art and science of mathematics. Indeed, the calculating table (counting board) is a machine – conceptual at that stage – and so are the abacus and all the contraptions that make counting, especially of numbers of a different scale than that of the immediate reality, easier, faster, cheaper. In the image (Pythagoras competing with Boethius), an abacist (one who knows how to count using an abacus) and an algorist (one who calculates using formulae) are apparently competing (Figure 11).It is appropriate to point out that there are many other forms of computing, such as counting the elements that make up a volume of liquid, or a mass (of stone, wood). The act of measuring most certainly implies numbers, as it implies the conventions of measuring units, for example, a shared understanding of what the numbers represent, based on the experience science behind their definition. Indeed, the numbers as such are data, their meaning results from associating the numbers to the measuring process, such as â€˜Under the influence of gravity.’ It should be clear at this time that counting numbers (or associating qualities, such as small, round, soft, smelly, etc.) is a discrete process, while â€˜falling in place’ (Figure 12) is based on analogies and is a continuous process. This distinction pretty much defines the numbering procedures – one in which representations are processed sequentially, according to some rules that correspond to the mapping from the questions to be answered to what it takes to answer it. Example: if you have 50 sticks of different length, how does one order them from shortest to longest? Of course, you can â€˜count’ the length of each (using a measuring stick that contains the â€˜counted’ points corresponding to the units of measurement) and painstakingly arrange them in the order requested. Or you can use a â€˜recipe,’ a set of instructions, for doing the same, regardless of how many there are and how long each one. Figure 12: Measurement by pouring medicine into a beaker. This in itself is a predictive computation: how many days worth of medicine are provided? 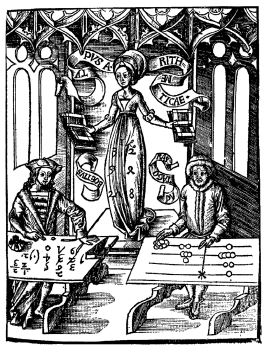 Let us recall the calculating table from Margarita Philosophica allegory of arithmetic: to the right, the human â€˜computer,’ checking each stick, keeping a record of the length of each, comparing them, etc. ; to the left the algorism (no spelling error here) – a person using a counting method by writing numbers in a placevalue form and applying memorised rules to these numbers. Historic accounts are always incomplete. Examples related to the need and desire to make counting, and thus measurement, more like machine operations are usually indicative of the dominant knowledge metaphor of the time. The machines of those past times were clocks and water wheels, and even the simple balancing scale (embodying the physics of the lever). They were used to estimate weight or the outcome of applying force in order to move things (the most elementary form of change, i.e., in position), or change their appearance. Recalling the various contributions to computation – Blaise Pascal and his Pascaline device; Leibniz and his computer; Schickard (Figure 13) and the calculating clock associated with his name; Babbage’s analytical engine inspired by the loom, etc. – means to recall the broader view of nature they embody. It also suggests that calculations and measurements can be performed basically in either an analog manner or a digital manner. Moreover, it illustrates how â€˜hot’ the issue of predictions was in astronomy, navigation, commerce and wars. The analogue corresponds to the continuity of phenomena in nature. Pouring water or milk into a measuring cup in order to determine the volume, and thus, indirectly, the weight, is indicative of what analogue calculations are. Similarity defines the domain. The lever on a scale functions in the analogue domain: add two or three more ounces until the scale is level, and that is the outcome of the calculation. Of course, to model simple phenomena and scale them is not difficult. But to reconfigure the analogue – from calculating the volume of a liquid to that of a gas or solid – is not easy. Moreover, it is hard to distinguish between what is actually processed and the noise that interferes with the data. The digital is focused on sampling, on making the continuous discrete. At low rates of sampling, much relevant data is lost. The higher the rate, the better the approximation. But there is a cost involved in higher rates, and there are physical limitations to how fast chips can go. In the context of interest in machines of all kind (for conducting wars, for successful wagers, for calculating the position of stars, for navigation, for making things, etc. ), the theoretic machine called automaton was the most promising. Evidently, the subject of interest remains the distinction between reaction-based processes – the theoretic machine has input, a number of inner states and an output that is the outcome of the calculation. There is no anticipatory dimension to account for. Even the â€˜non-trivial machine’ (Figure 14; Foerster and Poerksen, 2002) is still essentially reactive: part of the calculation implies a dynamic dimension of the inner state connections. It is conceivable that along this line of an autonomic function associated with the inner state, anticipation could be defined as the result of the self-organisation of such a machine. The Turing saga was written so many times (and filmed with increased frequency) that it is hardly conceivable that the most important about it was not yet made public. Still, to understand the type of computation associated with his name – moreover, if it is a possible path to anticipatory computing – a closer look is called for. Hilbert’s conjecture that mathematical theories from propositional calculus could be decided – Entscheidung is the German for decision, as in proven true or false – by logical methods performed automatically was rejected. Indeed, Turing (after Gödel and Alonzo Church) disappoints Hilbert, the mathematician who challenged the community with quite a number of hard problems (some not yet elucidated). First and foremost: Turing provided the mathematical proof that machines cannot do what mathematicians perform as a matter of routine: developing mathematical statements and validating them. This is the most important, and most neglected, contribution. Nevertheless, the insight into what machines can do, which we gain from Turing’s analysis, is extremely important. Wittgenstein (1980), recalling a conversation with Turing (in 1947) wrote: â€˜Turing’s machines:’ these machines are humans who calculate. And one might express what he says also in the form of games.” Indeed, the idea behind digital computers is machines intended to execute any operation that could be done by a human computer. (The word â€˜computer,’ first used in 1613 designates a person employed to calculate.) Turing (1948) himself wrote, â€˜A man provided with paper and pencil and rubber, and subject to strict discipline, is in effect a universal machine.’ At a different juncture, he added: â€˜disciplined but unintelligent’ (1951). Gödel (1972) would add, â€˜Mind, in its use, is not static, but constantly developing.’ The strict discipline means: following instructions. Instructions are what we call an algorithm. Intelligence at work often means shortcuts, new ways to performing an operation, even a possible wrong decision. Therefore, non-algorithmic means not subject to pre-defined rules, but rather discovered as the process advances. For those who fail to take notice of Turing’s own realisation that not every computation is algorithmic, non-algorithmic computations does not exist. (On this subject, I had a dialogue with J. Sowa, Berkeley Initiative on Soft Computing, December 2014). Automatic machines (a-machines, as Turing labelled them) can carry out any computation that is based on complete instructions. They are algorithmic. One, and only one, problem remains: the machine’s ability to recognise the end of the calculation, or that there is no end. That is, the halting problem turned out to be undecidable. This characterisation comes from Gödel’s work, where the undecidable names an entity that cannot be described completely and consistently. Turing’s a-machine consists of an infinite tape on which symbols can be stored, a read/write tape head that can move left or right (along the tape), retrieve (read) symbols from the tape or store (write) to the tape. The machine has a transition tape and a control mechanism. The initial state (one from among many on the transition tape) is followed by what the control mechanism (checking on the transition tape) causes the machine to do. This machine takes the input values, obviously defined in advance; it operates on a finite amount of memory (from the infinite tape) during a limited interval. The machine’s behaviour is pre-determined; it does depend on the time context. Examining the design and functioning rules of the a-machine, one can conclude the following: whatever can be fully described as a function of something else with a limited amount of representations (numbers, words, symbols, etc.) can be â€˜measured’, completely on an algorithmic machine. The algorithm is the description. With the a-machine, a new science is established: the knowledge domain of decidable descriptions of problems. In some sense, the a-machine is no more than the embodiment of a physics-based view of all there is, claiming that there are not fundamental differences between physical and living entities. This is a drastic epistemological reduction. It ascertains that there is a machine that can effectively measure all processes, physical of biological, reactive or anticipatory. Turing knew better than his followers. There is no benefit in making him the omniscient scientist that many proclaim him to be, reading into incidental notes ideas of a depth never reached. In the same paper Turing suggested alternate kinds of computation (without developing them). Choice machines (c-machines) involve the action of an external operator. The a-machines were his mathematical proof for the Hilbert challenge. Therefore, they are described in detail. The c-machine is rather a parenthesis. Even less defined is the omachine (the oracle machine advanced in 1939), which is endowed with the ability to query an external entity while executing its operations. The c-machine entrusts the human being with the ability to interact on the fly with a computation process. The o-machine is rather something like a knowledge base, a set subject to queries, and thus used to validate the computation in progress. Turing insisted that the oracle is not a machine; therefore the oracle’s dynamics is associated with sets. Through the c-machine and the o-machine, the reductionist a-machine is opened up. 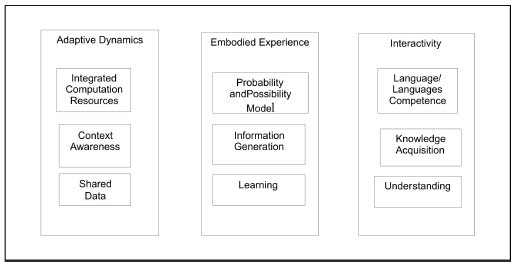 Interactions are made possible – some interactions with a living agent, others with a knowledge representation limited to its semantic dimension. Anticipation becomes possible. The story continues. Actually, the theoretic construct known as the Turing machine – in it’s a-, c-, and oembodiments – will eventually become a machine proper within the ambitious Automatic Computing Engine (ACE) project. (In the USA, the EDVAC at the University of Pennsylvania and the IAS at Princeton University are its equivalents.) â€˜When any particular problem has to be handled, appropriate instructions?are stored in the memory?and the machine is â€˜set up’ for carrying out the computation,’ (Turing, 1986). Furthermore, Turing diversifies the family of his machines with the n-machine, unorganised machine (of two different types), leading to what is known today as neural networks computation (the B-type n-machines having a finite number of neurons), which is analogue in nature. One more detail regarding Turing’s attempt to define a test for making the distinction between computation-based intelligence and human intelligence possible: human intelligence corresponds to the anticipatory nature of the living. Therefore, to distinguish between machine and human intelligence is quite instructive for our understanding of anticipation. It is well established by now that imitation, which was Turing’s preferred game, is by no means indicative of intelligence. Machines were programmed to answer questions in a manner that will make them indistinguishable from humans doing the same. This became the standard for winning in competitions meant to showcase progress in artificial intelligence (AI). To state that some entity – machine, person, simulation, or whatever else – can think is of low relevance, unless the thinking is about change, that it involves awareness of the future. Creativity, in its broadest sense – to originate something (a thought, a melody, a theorem, a device, etc.) is, of course, better suited to qualify as the outcome of thinking. However, at this level of the challenge, it should be clear that thinking alone is a necessary but not sufficient condition for creativity. Anticipation is the aggregate expression, in action, of all that makes up the living. Turing was not aware of this definitory condition of anticipation. It is difficult to speculate the extent to which he would have subscribed to it. But let us not lose sight of interactivity, of which he was aware, since on the one hand Turing computation is captive to the reductionist–deterministic premises within which only the reaction component of interactivity is expressed, and, on the other, since interaction computing (Eberbach et al., 2004) is not reducible to algorithmic computation. The most recent developments in the area of quantum computation, evolutionary computation and even more so in terms of computational ubiquity, in mobile computing associated with sensory capabilities, represent a grounding for the numerous interrogations compressed in the question: is anticipatory computation possible? Moreover, the â€˜Internet of Everything’ (IoE) clearly points to a stage in computation that integrates reactive and anticipatory dimensions. For a computation to qualify as anticipatory, it would have to be couched in the complexity corresponding to the domain of the living. Elsewhere, I argued that description of objects and phenomena, natural or artificial, that correspond to the intractable, make up the realm of G-complexity (Nadin, 2014). Anything else corresponds to the physical. 4.3.1. Beyond determinism Anticipation comes to expression within G-complexity entities. Quantum processes transcend the predictable; they are non-deterministic. Consequently, their descriptions entail the stochastic – the aim – which is one possible way to describe non-deterministic processes. To the extent that such quantum-based computers are embodied in machines (I am personally aware only of the functioning of D-Wave, and there is some question whether it is a real quantum machine), one cannot expect them to output the same result all the time. It is important, although very few scientists pursue this thought, to understand that Feynman argued for quantum computation in order to facilitate better understanding of quantum mechanics, not for treating what are called â€˜intractable problems.’ Factoring numbers is important (for cryptography, for instance), but to better understand complexity is much more relevant. Paul Benioff and Richard Feynman (independently, in 1982) suggested that a quantum system can perform computations. Their focus was not on how long it takes to factor a 130-digit number (the subject of Shor’s algorithm), not even the relation between time and the size of the input (the well-known P= NP ? problem of computer science). In computations inspired by theories of evolution or genetics, the situation is somehow different. Fundamentally, such theories have been shaped by the determinism of physics. Therefore, they can only reproduce the epistemological premise. But the â€˜computations’ we experience in reality – the life of bacteria, plants, animals, etc. – are not congruent with those of the incomplete models upon which they are based. They usually describe the finite (Elsasser, 1968). There are, of course, many attempts to overcome such limitations. But similar to computer science, where computation is always Turing computation (i.e., embodied in an a-machine), biology-based computation, as practiced in our days, is more anchored in physics, despite the changed vocabulary. Mobile computing, which actually is the outgrowth of cellular telephony. It is not at all a computing discipline. In virtue of its intrinsic hybrid nature as human–machine, it offers an interesting alternative. First and foremost, it is interactive – somehow between the c-machine and o-machine envisaged by Turing. Things get even more interesting as soon as we realise that the computer sine qua non telephone is also the locus of sensor interactions. In other words we have a computer that is a telephone in the first place, but actually a video scanner with quite number of functions in addition to communication. Before focusing on the ubiquity of mobile computation, it is worth defining, in reference to the first part of this study, various forms of computation that make possible forecasting, prediction, planning and even some anticipatory processes. Regardless of the medium in which probability-based computing is attempted – any physical substratum can be used for computational purposes – what defines this kind of calculation is the processing of probabilities. Probability values can be inputted to a large array and processed according to a functional description (Figure 16). The outcome reflects the nature of such computation. One particular form of anticipative evaluation can be computing perceptions (Zadeh, 2003). After all, anticipation from a psychological viewpoint is the result of processing perceptions, most of the time not in a sequential, but in a configurational manner (in parallel). For instance, facial expression is, as we suggested, an expression of anticipation (like/dislike, etc. expressed autonomously) based on perception. In the area of mobile computation, the meeting of many computational processes, some digital, some analogue, is the most significant aspect. Signal processing, neural network computation, telemetry and more are seamlessly integrated. The aspect pertinent to anticipation is specifically this integration, including integration of the human as a part of the interactive process. In this sense we need to distinguish between actions initiated purposely by the person (let’s say, taking a photo or capturing a video sequence) and actions triggered automatically by the behaviour of the person carrying the device (sensing of emotional state, evaluating proximity, issuing orientation cues pertinent to navigation). It is not only the â€˜a-machine’ on board (the computer integrated in the â€˜smartphone’), but the mobile sensing connected to various forms of machine learning based on neuronal networks and the richness of interactions facilitated, which make up more than an algorithmic machine. Indeed, this is an information–processing environment. Taken independently, what is made available is a calculation environment. The various sensors and the data they generate are of little, if any, significance to anticipation. In this calculation environment, we encounter context sensing, which neither the desktop machine nor any other computer provides, or considers relevant for their performance. Motion tracking, object recognition, interpretation of data and the attempt to extract meaning – these are part of the calculation environment – are conducive to a variety of inferences. What emerge are characteristics reminiscent of cognitive processes traditionally associated with thinking. This is an embodied interactive medium, not a black box, for calculations transcending the immediate. The model of the future, still rudimentarily limited to predictable events, reflects an â€˜awareness’ of location, of weather, of some other environmental conditions. A pragmatic dimension can be associated with the interpreted cand o- machines: â€˜What does the user want to do?’ (e.g., find a theatre, take a train, reserve a ticket, dictate a text, initiate a video conference, etc.). Inferring usage might still be rudimentary, but associated with learning and distribution of data over the cloud, it allows for better guessing, forecast, prediction and becomes a component of the sui gener is continuous planning process. The interconnectedness between the human and the device is extended to the interconnectedness over the network. These are Internet devices that share data, knowledge, experiences. It is quite possible that newer generations of such integrated devices will avoid the centralised model in favour of a distributed block chain process. Once issues of trust (of extreme interest in a context of vulnerability) are redefined among those who make up a network of reciprocal interest, anticipation and resilience will bind. The main reason to expend effort in dealing with a few aspects of this new level of computation is that it embodies the possibility of anticipatory computing. This is not to say that it is the only way to achieve anticipation performance. In the evolution from portable wireless phones to what today is called a â€˜smartphone,’ these interactive mobile computing devices â€˜learned’ how to distinguish commuting, resting, driving, jogging, or sleeping and even how to differentiate between the enthusiasm of scoring in a game and the angry reaction (gamerelated or not). A short list (incomplete, alas!) for suggesting the level of technological performance will help in further seeing how integration of capabilities scales to levels comparable to those of anticipatory performance. From GPS (Global Positioning System) connection (and thus access to various dynamic knowledge bases), to sensors (accelerometers, gyroscope, etc. ), communication protocols (facilitating WiFi, Bluetooth, near-field communication), everything is in place to locate the user, the device, the interconnected subjects, the actions meaningful within the context. multi-core processors, large memories (not the infinite Turing machine tape, but by extension to the cloud close to it) and high performance input and output devices (cameras, microphones, touch screen, temperature sensitive surfaces) work in concert in order to support the generation of a user profile that captures stable as well as changing aspects (identity and dynamic profile). 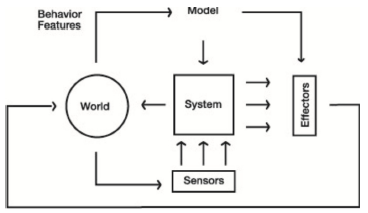 Models connect raw sensed data in order to interface the subject in the world and the mobile station. Information harvested by a variety of sensors (multimodal level of sensing) is subject to disambiguitisation. It is exactly in respect to this procedure of reducing ambiguity that the mobile device distinguishes between the motoric of running, walking, climbing stairs, or doing something else (still within a limited scope). Example: the attempts to deploy physical therapy based on the mobile device rely on this level. The habit component compounds â€˜historical’ data – useful when the power supply has to be protected from exhaustion. Actions performed on a routine basis do not have to be re-computed. Other such strategies are used in the use of the GPS facility (path tracking, but only as the device moves, i.e., the user is on a bike, on a car, train, etc.). Overall, the focus is on the minima (approximate representations). Instead of geolocation proper, infer location from data (as in the person’s calendar: restaurant, doctor, meeting, etc.) In some ways, the mobile device becomes an extension of the perception dimension of the living. Although there is nothing that this kind of aggregated computation has in common with quantum computation, the focus on minima is relevant. There is no need for excessive precision in the performance of most of the mobiles. Nevertheless, the user taking advantage of the on the fly translation of a phone/video conversation easily makes up the missing details or corrects the sentence. Images are also subject to such corrections. 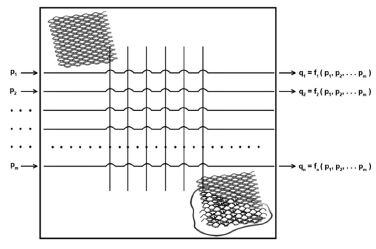 The metaphors of quantum computation, in particular the non-locality aspect, quite appropriately describe interactive processes, which no close algorithmic computation could perform. It is at this level where the once upon a time classic texts of Bennett (1990, 1995), Bennett and Landauer (1985) and others make evident the limits of an understanding of computation limited by the Turing machine model embodied in physical devices. Truth be told, no one has come up with a reassessment of the new context for open forms of computation. I am inclined to doubt a statement such as â€˜A computation, whether it is performed by electronic machinery, on an abacus or in a biological systems such as the brain, is a physical process’ (Bennett and Landauer, 1985, p. 58). Moreover, I have doubts that the question â€˜How much energy must be expended to perform a particular computation?’ is very meaningful in respect to interactive computations. In an information processing environment, energy is not only that of the battery powering the device, but also of the interactions. The neat distinctions of physics (often applied to living processes despite the fact that they are only partially relevant when it comes to life) are simply inadequate. Anticipation expressed in action has a specific energy condition corresponding to the fact that entropy decreases as a result of activity (Elsasser, 1968). These considerations, beyond the purpose of this article, deserve further examination. But let’s continue with more details of the mobile paradigm and the latter’s relevance to anticipatory computing. The first aspect to consider is the integration of a variety of sensors from which data supporting rich interactions originate. Distinct levels of processing are dedicated to logical inferences (obviously while jogging, one is rarely in the office, unless a â€˜walking’ machine is used, or while driving the person is far from the desktop, etc.) with the purpose of minimising processing. Technical details – the physics, so to say – are important, although for our concerns the embodied nature of interaction between user and device are much more relevant. Anticipation is expressed in action pertinent to change (adapt or avoid are specific actions that everyone is aware of). It seems trivial that under stress anticipation is affected. It is less trivial to detect the degree and the level of stress from motoric expression (abrupt moves, for instance) or from the speech data. Still, a utility, such as Stress-sense, delivers useful information, which is further associated with blood pressure, heart rhythm, possibly EMG (electromyography) and what results can assist the individual in mitigating danger. The spelling of specific procedures – such as the Gaussian Mixture Models (GMM) for distinguishing between stressed and neutral pitch – is probably of interest to those technically versed, but less so for the idea we discuss. El Kalioubi (whose work was mentioned previously) developed a similar facility for reading facial expression. In doing so, she facilitates the anticipatory dimension of emotions to a degree that this facility makes available information on attention – the most coveted currency in the world of computer-supported interactions. During a conversation we had (at SIGGRAPH 2010, Boston, she was just starting her activity at MIT), she realised that Mind Reader – her programme at the time – was merely making predictions under the guidance of a Bayesian model of probability inferences. Since that time, at Affidex, her focus is more and more on associating emotional states and future choices. It is easy to see her system integrated in mobile devices. Important is the realisation that the description of physical processes (cause-and-effectsequence), and of the living process, with its anticipatory characteristics, fuse into one effective model. This is a dynamic model, subject to further change as learning takes place and adaptive features come into play. In the physical realm, data determines the process (Landauer, 1996). For instance, in machine learning, the structure of classifiers – simple, layered, complicated – is partially relevant. What counts is the training data, because once it is identified as information pertinent to a certain action, it will guide the performance. However, the curse of dimensionality does not spare mobile computing. Data sets scale exponentially with the expectation of more features. Many models excel in the number of features exactly because their designers never understood that the living, as opposed to the physical, is rather represented by sparse, not big, data. This is the result of the fact that living processes are holistic (Chaitin, 1970). 4.3.4. Community similarity networks. How does the block chain model scale up? Without the intention of exhausting the subject, I will discuss a few issues pertinent to directions that pertain to the anticipation potential of interactive mobile devices. The tendency is to scale from individuals to communities. Autonomous Decentralised Peer to Peer Telemetry (the ADEPT concept that IBM devised in partnership with Samsung) integrates proof of work (related to functioning) and proof of stake (related to reciprocal trust) in order to secure transactions. At this level, mobile computation (the smartphone in its many possible embodiments) becomes a part of the ecology of billions of devices. Each device – phone, objects in the world, individuals, animals, etc. – can autonomously maintain itself. Devices signal operational problems to each other and retrieve software updates as these become available, or order some as needed. There is also a barter level for data (each party might want to know ahead of time â€˜What’s behind the wall?’), or for energy (â€˜Can I use some of your power?’). There is no central authority; therefore one of the major vulnerabilities of digital networks is eliminated. Contracts are issued as necessary: deliver supplies (e.g., for house cleaning, or for a 3D print job). The smartphone can automatically post the bid (â€˜Who has the better price?’), but so could any other device on the Internet-of-Everything. Peer to Peer in this universe allows for establishment of dynamic communities: they come into existence as necessary and cease to be when their reason for being no longer exists. So-called community similarity networks (CSN) associate users – individuals or anything else – who share in similar behaviour. A large user base (such as the Turing o-machine would suggest) constitutes over time an ecosystem of devices. Fitbit (digital armbands) generates data associated with physical activities (exercise), rest, diet. 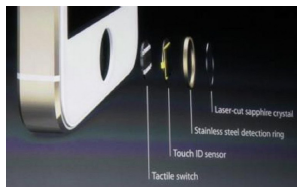 The Apple Watch scales way further, as a health monitoring station. To quote a very descriptive idea from one of the scholars I invited to the upcoming conference on Anticipation and Medicine (Delmenhorst, Germany, September 2015). Real time physiological monitoring with reliable, long-term memory storage, via sophisticated â€˜physiodiagnostics’ devices could result in a future where diseases are diagnosed and treated before they even present detectable symptoms (McVittie and Katz, 2014). On this note I would argue with Pejovic and Musolesi (2015) that neither Mindmeld (enhancing online video conferencing) nor GoogleNow, or Microsoft’s Cortana (providing functionality without the user asking for it) qualify as anticipatory. Nevertheless, I am pretty encouraged by their project (anticipatory mobile DBCI, i.e., behaviour change interventions) not really because my dialogue with them is reflected in the concept, but rather because they address current needs from an anticipatory perspective. In practical terms, anticipatory computing would have to be embodied (in effective agents, robots, artefacts, etc.) in order to be expressed in action. A possible configuration (cf. Figure 19) would have to integrate adaptive properties, an efficient expression of experience, and, most important, unlimited interaction modalities (integrating language, image, sound and all possible means of representations of somato-sensory relevance). 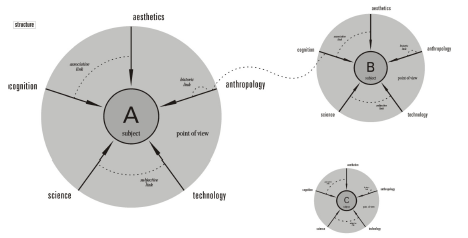 In view of the newly acquired awareness of decentralised structures of interaction/interaction structures – for example, pragmatic dimensions of computation – it can be expected that computation as a utility, not as an application, would be part of the complex process of forming, expressing and acting in anticipation.